I recently returned from a business trip to a city that I’ve wanted to visit for a long time…Philadelphia! There are three main reasons I wanted to visit Philly: 1) Pat’s King of Steaks, 2) Geno’s Steaks, and 3) the Simeone Foundation Museum. Once the business portion of my trip was complete, I quickly sampled the original Philly cheese steak sandwiches from 1 & 2 (Pat’s was the best!) before driving over to the museum to meet up with Dr. Frederick Simeone. Dr. Simeone is one of those rare car collectors who take the bold step to share his collection with the public. The emphasis of the 60+ car collection is on competitive amateur sports cars, which are housed in a non-descript warehouse in South Philly. The cars are displayed amongst special ‘stage’ style settings that reflect the cars’ original racing venue. There are sections devoted to Pre WWI racing, Brooklands, Targa Florio, Mille Miglia, Watkins Glen, Sebring, Le Mans, along with many others. A large annex behind the main building houses the NASCAR and sporty car collections. The Simeone collection is unique in that the majority cars are displayed in their as-raced condition. Do not expect to see 100 point restorations, but if you want to see a Cobra Daytona Coupe (CSX2287) with all of its battle scars, you need to visit the museum. The main reason I wanted to visit the museum was to see Dr. Simeone’s Allard J2 #1975. The car is pearl white with a blue racing stripe running down the middle. The car appears to be in very original condition, although at some point the chassis was painted navy blue. Very little is known about J2 1975 except that it was delivered to Perry Fina’s on July 13, 1951 and the original color was dove gray with a red interior. (If you know anything about this car, please email us). Incidentally, Dr. Simeone has also amassed one of the most complete libraries of automotive brochures in the world, including every known Allard brochure. His car collection is truly amazing. I’ve never seen so many significant sports racing cars under one roof. It’s really impossible to give them all credit, but I’ll touch on two highlights. Dr. Simeone’s affinity for Alfa Romeos began with the purchase of his first car – an Alfa. He has since acquired an enviable collection of ten racing Alfas, which is one of the largest in the world. The collection includes a 1925 RL Super Sport (raced at Brooklands), a 1938 8C 2900B MM (won the 1939 Mille Miglia), and the 1975 33-TT-12 (Targa Florio). 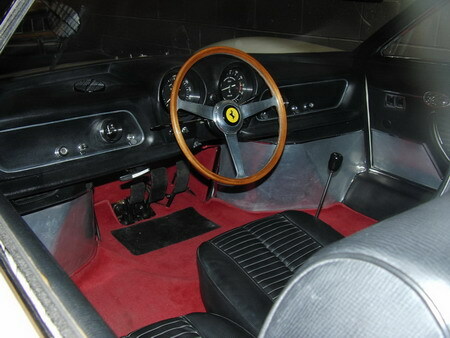 One car tucked away in the Annex really caught me off guard….it was the 1966 Ferrari 365P Berlinetta Speciale. One of only three made, the 365P was unique in that it featured a central driving position, with a passenger seat on each side. I was surprised by this because I had always thought my favorite sports car – the McLaren F1 – was the first car to have a central driving position. The 365P is wide and long, but very attractive. Direct access to the cars on display is somewhat restricted. However one Saturday each month, the museum brings out a few select cars to demonstrate on their large parking lot – giving the public a chance to enjoy the site and sounds of these cars in motion. The schedules of their demonstration days are on their web site at www.simeonefoundation.org. Additionally, if you make contact with the museum ahead of time you might be able to get a guided tour of the museum. I’ve been to several car museums and this is one of the best. The cars cannot be beat, and the displays are truly unique in helping visitors to visualize the settings that these great cars raced in. If you live in the Northeast or are planning a trip there, you really owe it to yourself to visit Philadelphia to see the Simeone Collection and eat an original Philly cheese steak sandwich.